Now I’m no ailurophobe – though, to be honest, I’m a dog person, not a cat fancier – so nearly all the 70 rare felines, from the tiny margay to the stoutest tiger, don’t get my heart racing. But the facility’s lone mountain lion, that guy freaks me a bit. Completely irrational, I know. But maybe I feel vulnerable because I frequent trails in the foothills, which the lions call home, and read with equal parts fascination and dread about occasional sightings of the stealthy quadruped both in open space and, as was the case a few months back in the Bay Area, at a strip mall. This particular cat, which keepers named Serrano because it was found on a trail of the same name, came to the center in 2012 after it was captured skulking around Whiting Ranch in Orange County. Department of Fish & Game officials determined that Serrano, then less than 2 years old, was “not acting” like other young lions, so they did not release him back to the wild. She led me past spacious cages housing Pallas cats of Central Asia, a black leopard from Thailand and an amur leopard from Russia to a large enclosure that look a lot like the area around the American River confluence. There was, however, no mountain lion. Wait, people have mountain lions as pets? Serrano’s neighbors seemed much more outgoing. The North Chinese leopard and black panther in adjoining cages strutted and sunned themselves, occasionally leaping about boulders as if practicing parkour. Serrano? Not even a fleeting glimpse. 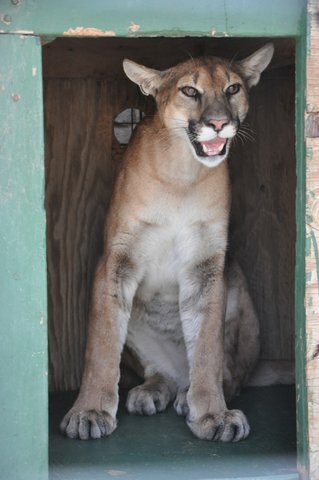 Houston didn’t even bother to try to lure the lion out, as she did by playfully calling the names of cats in other enclosures. A mountain lion, apparently, cannot be so easily cajoled. Serrano’s been a resident here for two years – about half his life. Houston said the cat hasn’t altered his stealthy mountain lion ways, keeping to himself. These aren’t, apparently, the most social of animals. Two visitors to the center, who identified themselves only as Margo and Bruce, stopped by to take a gander and, seeing no activity in Serrano’s lair, turned their attention across the walkway to a jungle cat (Latin name: Felis chaus), found in Southeast Asia and looking like an extra tall and long domesticated house cat. Bruce did his darnedest to lure the jungle cat, aptly named Pandora, out of her boxlike enclosure. Margo said she and Bruce, who live in Tehachapi less than an hour away, drop by often to visit the cats. They have, indeed, spotted Serrano and shrug when I asked if he looked fierce. Then she whipped out her smartphone and clicked on a photo of her house cat, a flamepoint Siamese that even a dog lover would find cute. Cat lovers make up most of center’s visitors, though you could hardly call any of the feline inhabitants here cute and fluffy. More like sleek, sinuous and sneaky. James, for the record, hardly seemed fazed by the 160-pound spotted specimen with paws as large as dinner plates. The couple pushed the stroller past Serrano’s enclosure, saw no activity, kept moving. But I wasn’t yet ready to bail on Serrano. I lingered and read the laminated plaque outside his lair. “Deer are the most important part of the puma’s diet,” the poster read, but, really, they’ll eat anything from beavers to rabbits, raccoons to opossum. Next to that was a handsome photograph of Serrano, regally sitting on his haunches. But I just kept fixating on his paws, so big, so lethal. Now there’s a comforting thought.